Come as Clients.. Leave as Friends!! Come for a fishing experience of a lifetime! finest fishing grounds in the world. You will fish Hannibal Bank, Isla Montuosa, the Triangle, Isla Ladrones and other local areas. 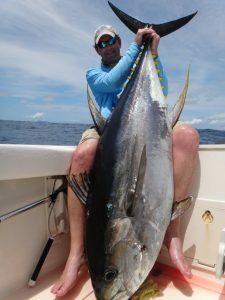 Encounter numerous opportunities to catch monster Yellowfin Tuna, Blue Marlin, Black Marlin, Pacific Sailfish, Wahoo, Dorado, Jaw Breaking Cubera Snapper, Amberjack (aka-reef donkey) and Grouper just to name a few. Very large Roosterfish frequent the countless rocky shorelines and beaches and aggressively attack poppers and live bait. 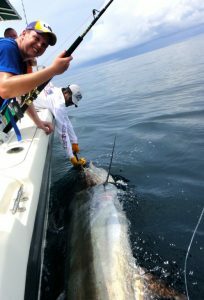 Over 50 IGFA World Records have been established in the rich waters of the Gulf of Chiriquí. Trolling, Popping, Jigging and Live Baiting are used to target specific species and provide you with a variety of fishing experiences. They all end up with the same results, a bent rod! Regardless of whether you are an experienced angler or just starting out, we can customize a fishing package just to fit your specific needs. We offer 1 day fishing trips as well as 2, 3, 4, or 5 day fishing vacation packages. Come Fish Panama offer’s affordable packages customized to your needs. Whether it’s a day charter or multiple-day lodging and fishing package, we can accommodate you. Our packages provide you with two unique lodging options to fit your taste and budget. After a restful night and delicious breakfast, the Captain will pick you up at dock side just steps from your bungalow. At day’s end, bring the chef the “catch of the day” and enjoy seafood at its finest. Our team will work hard to earn your trust and to exceed your expectations in order to keep you wanting to come back for more! Whether you plan to fish offshore or inshore in the Republic of Panama, we recommend that you book early, as dates fill up quickly. Come Fish Panama operates year-around with the exception of October, when we close in order to maintain our equipment and replenish our lost and damaged lures to our very high standards of excellence. Start planning your dream fishing adventure with the help of one of our fishing experts by visiting our “Contact us” page. We look forward to having you fish with us in Tropical Panama very soon!